Dnm2 downregulation rescues the neonatal lethality of Bin1–/– mice. (A) Targeted disruption of mouse Bin1 gene. Exon 20 (blue) and surrounding intronic region (orange). (B) Overview of lifespan and time points used to analyze Bin1–/– Dnm2+/– mice. (C) Mice whole-body weight, and representative photo of mice at 12 months of age. 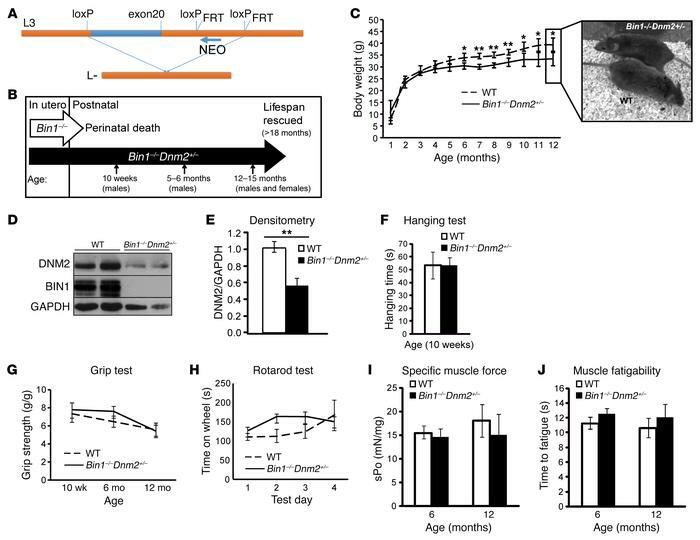 Note that all genotyped Bin1–/– Dnm2+/– mice survived beyond 12 months of age. (D) Immunoblot analysis of DNM2 and BIN1 protein expression from muscle lysates. (E) Relative level of DNM2 protein expression was determined by densitometry of DNM2 signal standardized to GAPDH. n = 4 mice/genotype. (F) Hanging test where 10-week-old mice were required to hang from a cage lid for up to 60 seconds. (G) Four-paw grip test. (H) Rotarod test performed under acceleration mode (4–40 rpm in 5 minutes). n = 3 trials/mouse/day, 6-month-old mice. (I) Specific muscle force (sPo) of the tibialis anterior (TA) muscle (mN force/mg TA muscle). (J) Fatigue of the TA muscle, measured as the time taken to reach 50% of the maximum muscle force (seconds). All graphs depict the mean ± SEM. Statistical analysis was performed using an unpaired 2-tailed Student’s t test for all graphs except H, where a 2-way ANOVA followed by Dunn’s multiple comparison test was used. *P < 0.05, **P < 0.01. n = minimum 5 mice per group for C, F–J.